Ultrasound-guided subcostal transversus abdominis plane block (TAPB) is widely used for abdominal surgery; however, arterial plasma concentration of the anesthetic ropivacaine after the blockade is still unclear. We evaluated ropivacaine concentration after subcostal TAPB in adult patients undergoing upper abdominal surgery. Twelve patients with American Society of Anesthesiologists physical status 1–2 were enrolled. They received ultrasound-guided subcostal TAPB with 0.45 % ropivacaine at 3 mg/kg. Arterial plasma samples were collected at 15, 30, 45, 60, 90, and 120 min after the blockade and analyzed for total ropivacaine concentration using liquid chromatography and mass spectrometry. At every time point, the maximum concentrations (C max), and time to the C max (T max) were recorded. The mean C max and T max were 1.87 (0.78) µg/ml and 31.3 (16.7) min, respectively. No adverse events or clinical symptoms indicating systemic toxicity were observed during this study. 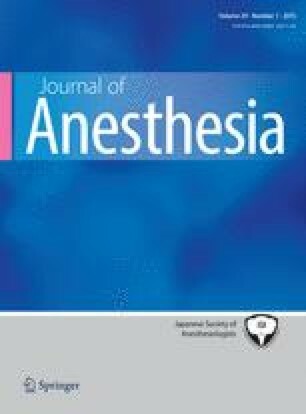 The study demonstrated that administration of ropivacaine at 3 mg/kg during subcostal TAPB led to rapid increases in plasma concentration of the anesthetic during the first 2 h after the blockade. C max nearly reached the threshold for systemic toxicity.